Use /comeheretoggle or /cht to enable or disable the chat spam. A big thank you to HonorGoG, Tristanian, Ackis and Moongaze for helping me to get the code right and Zipcat for helping me test. .
With this new version I added some code so that your toon will say what you hear when you use Death Grip. added a slash command to toggle the chat spam on and off. Added some extra code to play the new Female sounds for Female toons only. Female DKs will now hear "Come Here" and "Get Over Here" in a more feminine tone. Male DKs will still have the same sounds as before. added some some extra code so that when you use Death Grip not only will you hear it but you will also say it. changed spellName to spellID to make it usable across all globals... needs testing. added some code to make the sounds only trigger when YOU cast Death Grip. is there going to be an update for this or is this pretty much dead? I keep getting LUA errors, like every second. lagging me to like 5 fps. if there is a quick fix i can do for this that'd be great. Love this addon! Last edited by tinyu : 01-16-18 at 08:22 AM. Any issues please let me know. Just a toc updated if anyone has any issues please report them. just updated the toc to work with 5.0 can any Resto Druids please test with Symbiosis when you get to level 87 when MoP goes live. i dont think there is anything i can do about that. It's up and working properly now. The id code (9979) for the new update doesn't bring up the addon in the UI manager. what is the command to open the configure? Love this mod, from the first moment i saw a DK death grip I thought of Scorpion. I have a suggestion I would like, and i think others might too. Is there a way to make the "Get Over Here" & "Come Here"Text appear in Combat Text as a crit, rather than or along with, the chat text? That would be the Diamond ring on this mods finger. P.S. 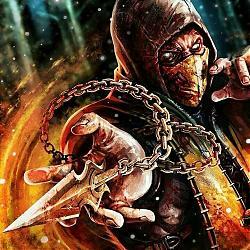 I also have a sound file of scorpions spear that i would love to add with the say... how much trouble would that be? Last edited by Bentobaku : 12-02-10 at 10:17 PM. Corpse Explosion currently just says 'Boom!' ( also been set to say 'I did it.' and a few others.) There is a special place in my heart for the exploding bodies of my foes... and sometimes comrades... Oops! Did I do that? Strangulate says 'Silence! I kill you.' Ala Achmed the Dead Terrorist. Pestilence says 'Come on! Get down with the Sickness!' Ala Disturbed. Mind Freeze says 'Brain Freeze' They can't all be zingers. I made one that says the chorus to Get Up~by James Brown when I dance and several that combine some of the funner flirt emotes. lol cuz I'm cool like that. But most have got a kick out of 'em. I was gonna make one for Death Grip but, this is even better.